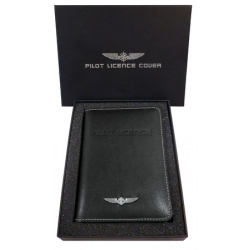 This elegant PILOT EASA LICENSE COVER is made of high quality eco-friendly leather with silver metal wing on the outside. Three further pockets for credit cards, one for a business card, another one for paper and the embossed PILOT® logo. 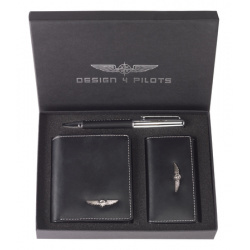 This elegant Pilot Passport Set is made of high quality eco-friendly leather. Delivery in a black gift box with silver printing. 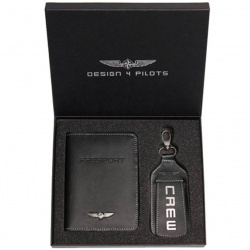 This elegant PILOT CARD HOLDER is made of high quality eco-friendly leather. A stainless steel money clip is on the front site and below a silver metal wing and an embossed PILOT®-Logo on the back. Inside six pockets for credit cards and one for a business card. The quick access-openings you recognize immediately the right card and this allows you to handle it simple and convenient. 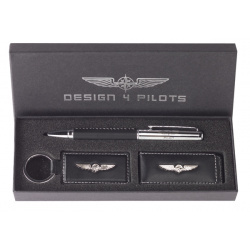 This elegant PILOT MONEY CLIP SET is made of high quality eco-friendly leather.